(L-R) Kourtney, Kim & Khloe Kardashian. Oh, what do we have here? The Kardashian sisters are back at it again! With being slapped with a lawsuit because of the makeup line - Khorma and set to launch their clothing line Kardashian Kollection in Dorothy Perkins, London this November. Filming the spin-off of their reality show Kourtney and Kim take Miami being wives/girlfriends/mothers to their loved ones and much more. 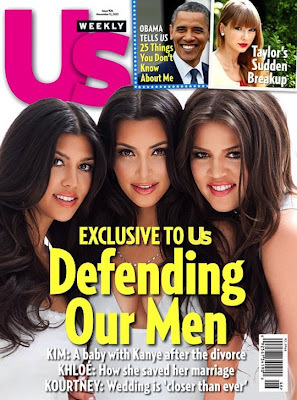 The Kardashian sisters are on a roll and this time they're defending their men. With those of us that watch their reality show Keeping Up With The Kardashians on E! you'll see that they all have a close bond with their men. Kourtney - who has two kids with boyfriend - Scott Disick says that a "Wedding is 'closer than ever'". Well, apparently that's true as a close source close to Scott said that he was "ring shopping". Let me say this - Scott has a good eye for expensive and fancy things, so we know that he has the ball in that court! Kim - who is going through a nasty divorce after being wed for 72 days to Brooklyn Nets, Basketball Player - Kris Humphries and is now currently dating rapper Kanye West said to the magazine "A baby with Kanye after the divorce." I'm guessing Kanye really is the guy for Kim! Kim-Ye is in tha house!! Khloe - the only Kardashian married, to Basketball Player - Lamar Odom who plays for the Los Angeles Clippers discusses "How She saved her marriage". What needs saving? They're so in-love. That Khlo-Lam love! US Weekly is out on newsstands today. Pick up your copy to read the full article on what the Kardashian sisters had to say!